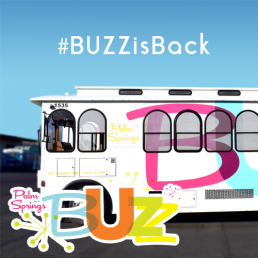 Palm Springs residents and visitors can once again catch the BUZZ Trolley, a fun and easy way to travel across the city. Officials marked the reopening with a ribbon cutting and relaunch event on January 10. The City of Palm Springs previously operated the system through last June. Councilmember Lisa Middleton, who also sits on the SunLine Transit Agency’s Board of Directors as the City’s representative, worked with the agency to bring forward a proposal for SunLine to take over the BUZZ operations. Middleton also serves as an RCTC Commissioner. The BUZZ will run year-round, Thursday through Saturday, from noon to 10 p.m. Service will operate through June 2020, when the Palm Springs City Council will review whether to continue the City’s subsidy for the service. As part of the proposal, the agency will take over the management of the system, capital costs and purchase the trolleys. The fun and colorful branding will remain the same.